At low engine speeds where ordinary engines operate at low efficiency, only the motor itself is used for driving(*4). This produces a new driving sensation that is quiet and nimble. The engine starts operating and the motor assists with driving. Great acceleration is achieved with two power units working in tandem. When braking or if the accelerator pedal is not being used, deceleration energy is converted to electricity to recharge the battery efficiently. 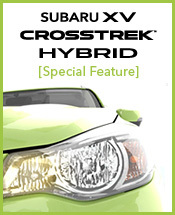 The system also provides a completely natural braking feel. *4: The engine might restart depending on driving conditions. *5: The engine might not stop depending on driving conditions. * Various different conditions affect system operation, which may differ depending on driving conditions or the state of the car.